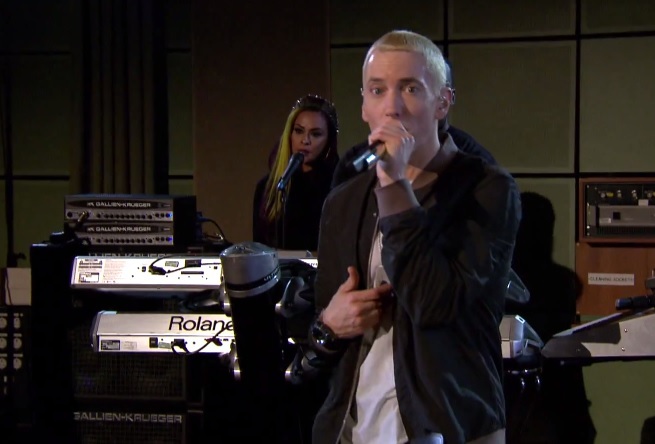 Here’s a new visual from Eminem’s recent performance at BBC’s Maida Vale studios for Radio 1. With a full band behind him and Alchemist on the turntables, Slim Shady decided to serve up a live rendition of his classic hit, “Stan,” which is featured on the Detroit native’s timeless album The Marshall Mathers LP. This entry was posted in Live Performance, Video and tagged alchemist, concert, eminem, hip hop, live performance, rap, slim shady, stan, the marshall mathers lp. Bookmark the permalink.